Yerba mate tea has a smoky, bitter flavor, which South Americans have used for centuries as an everyday beverage and medicine, even during pregnancy. It has been championed for its high antioxidant content and for its ability to lower cholesterol and prevent certain cancers. Because yerba mate does contain caffeine, it should be consumed under the limit recommended by the American Pregnancy Association. Always consult your doctor if you're unsure whether a food or supplement is safe during your pregnancy. A 2005 study published in the "Journal of Nutrition" assessed the effects of drinking yerba mate tea during pregnancy. Thousands of Brazilian mothers were interviewed in their delivery rooms just after giving birth. Many drank yerba mate daily during pregnancy, whereas others drank it weekly and some never had it. Researchers recorded the pregnancy duration and the birth weights of the babies, and found no association of either with yerba mate consumption. Contrary to their hypothesis, they concluded there were no harmful effects of yerba mate tea on fetal growth and development, nor did it increase the prevalence of preterm birth. The American Pregnancy Association reports that moderate caffeine intake during pregnancy does not negatively affect pregnancy. The organization defines a moderate intake as 150 to 300 milligrams daily. According to CaffeineInformer.com, yerba mate tea contains 85 milligrams of caffeine in an 8 ounce cup. Drinking no more than 3 cups daily will keep you under the limit set out by the American Pregnancy Association as long as you're not consuming additional caffeinated beverages or foods. In 2008, one of the largest studies investigating the effects on fetal growth of consuming caffeine during pregnancy was published in "BMJ." The study reported that the risk of fetal growth constriction becomes apparent when you consume more than 100 milligrams of caffeine a day. Study participants who consumed more than 200 milligrams per day had a reduction in birth weight of 60 to 70 grams. The results of this study may encourage you to limit yerba mate to no more than one cup daily if you're pregnant. Although two to three cups are unlikely to cause birth defects or other serious conditions, there is a relationship between caffeine intake and birth weight. 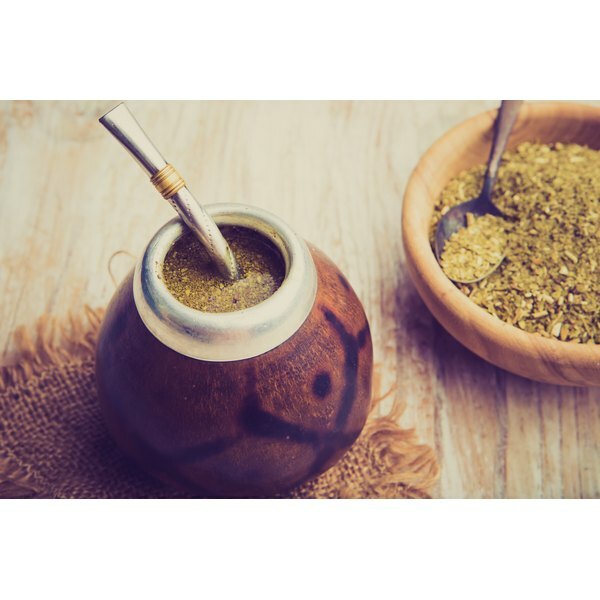 Yerba mate can provide some of the essential nutrients important during pregnancy. It contains vitamins B and C, potassium, manganese and zinc. It also has beneficial plant compounds, including quercetin, theobromine and theophylline. Studies have suggested yerba mate can prevent liver damage, and its antioxidant qualities have been shown to protect DNA oxidation and lower the risk of cancer. It could also be helpful in weight management.